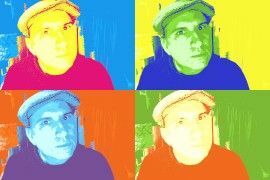 With flawless character transformations, gut-busting comedy sketches, and sparkling social commentary, Peterson Toscano, a quirky queer Quaker from the heart of the Amish Country, is the one of America’s most original comics. A bible scholar, an LGBTQ activist, and a skilled actor, Peterson will share excerpts from his original one-person comedies including, Doin’ Time in the Homo No Mo Halfway House, Jesus Had Two Daddies, Transfigurations—Transgressing Gender in the Bible, and Does This Apocalypse Make Me Look Fat? From the gay conversion therapy to bizarre yet moving readings of the Bible to the price of coffee on a warming planet, Peterson brings heart and humor to the most important issues of our day. You will laugh and feel glad to be alive. Hear an excerpt from Peterson’s newest play, Does This Apocalypse Make Me Look Fat?